Storage is perfect for making the most of those small spaces dotted around the home. From fireplace alcoves to under-stairs storage compartments, each design is made to measure to ensure that not an inch of space goes unused and that your design is perfectly adapted to your needs. 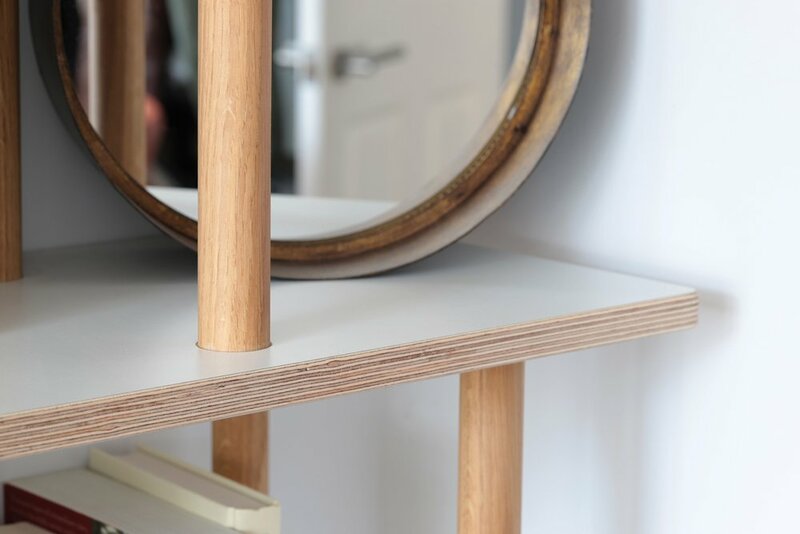 Lozi created these minimal set in birch plywood alcove cabinets to provide a large space to store and display her favourite books, with extra hidden space to hide all those unattractive but essential household fixtures (Printer, internet router etc). Several other shelving systems , bathroom storage and wardrobes were created for this house. 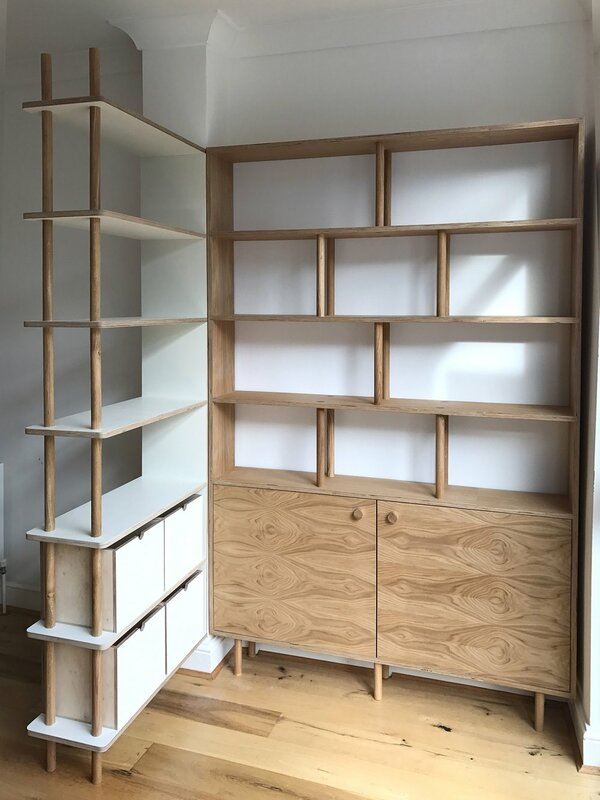 "Soroush made some of the furniture in my new flat - he helped me through all the design process and really listened to what I wanted! Great to work with and omg I love the pieces he's made for me, especially the bed. Would really recommend." As part of a large House of Lozi project, Vicky was looking for a neat design to fit in this large alcove in her living room. 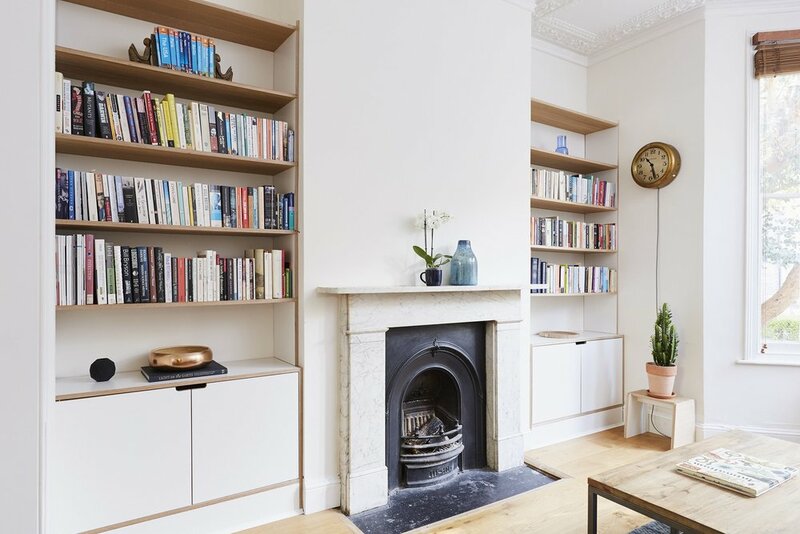 Four cupboards hide away unsightly objects whilst open plan bookshelves proudly display her favourite novels. 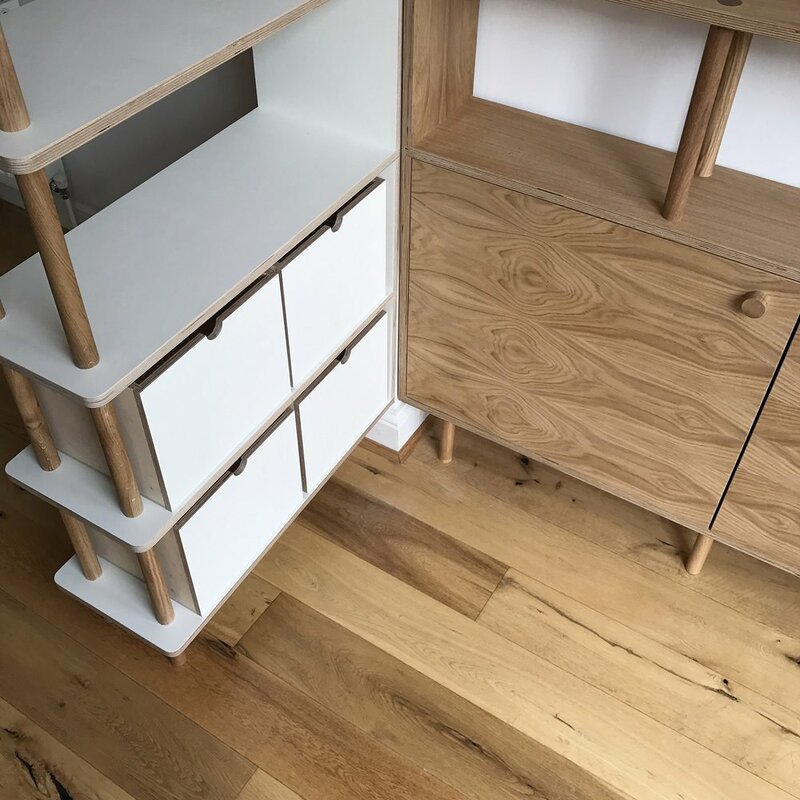 Made from birch plywood and oak dowels, this storage was finished in white laminate to blend with the rest of the room. Ben wanted to create a home office within his living room without dominating the space, cutting off the room or stopping the light coming in from the large doors to the garden. 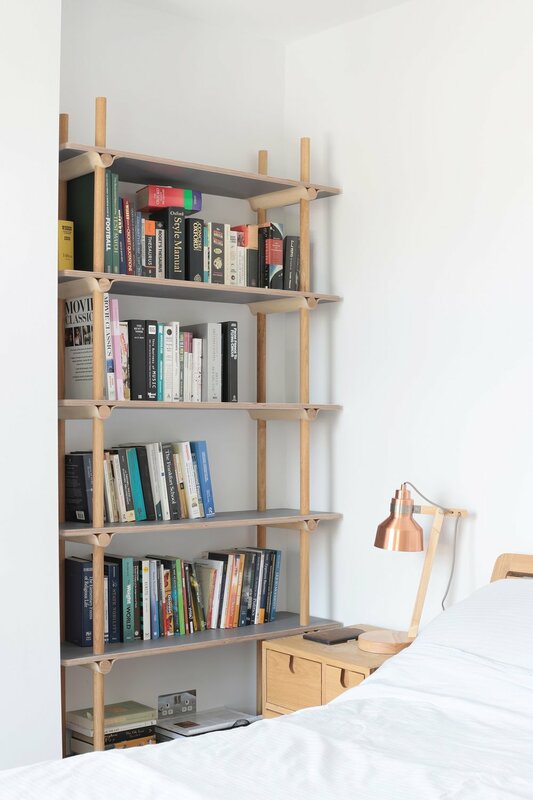 Lozi created this neat and airy room divider that doubles as a workstation and a bookshelf from two L shaped storage systems. A compact desk peaks out form the wall on the right hand side whilst a large cupboard not he left allows Ben to storage files and computer equipment without it being on display. Nick needed a modern and masculine design to fit into his living room alcove. This tall and narrow piece combines tall lower cupboards with sliding doors and open plan bookshelves. 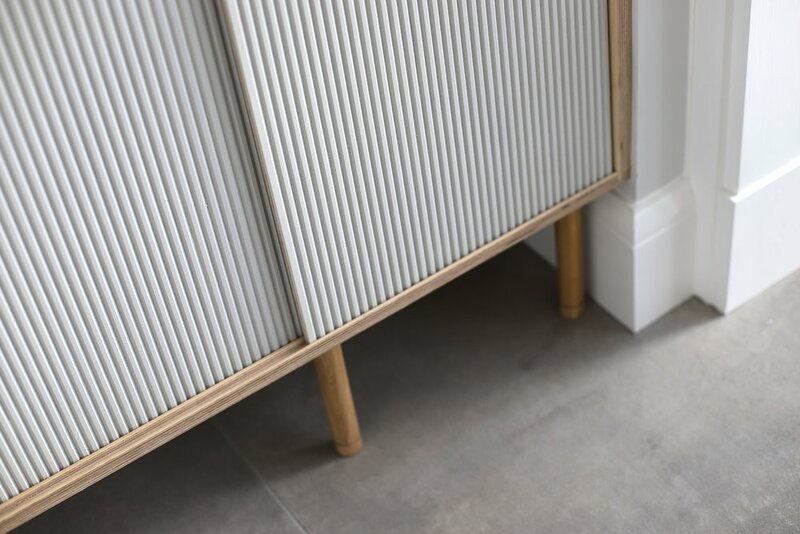 The corrugated plywood doors ties the whole piece together whilst the different shades of grey paint modernise the look. Rupinder needed some practical storage to fit under his apex roof, making the most of the slanted ceiling and alcove space. Large wardrobe spaces below support a checkerboard of cupboards, providing ample storage whilst making the best use of the room. A bespoke matching bedside table and Lozi’s curved bed frame combine to create an elegant loft bedroom. And of course the Wave Shelving can be customised to fit your alcove space. Discover other Lozi storage solutions in our online shop.